How did people describe ANNANN when they met her the 1st time? This question didn't take me more than 5 seconds to answer it. Born a beauty, ANNANN was given to my family when she was only one month old (or two months old? Not sure). 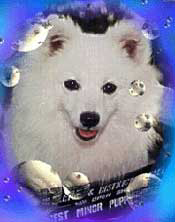 ANNANN was a female Japanese Spitz dog with a thick snow-white coat, a pair of big bright clear black eyes, and a tightly curled tail looked just like cotton candy. Of course ANNANN liked to go out and play but she always kept herself as tidy as possible. She never sitted down when she went outside unless a clean mat was placed on the ground. 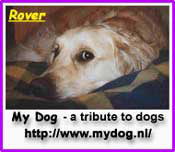 Last month (May, 2000) I watched a documentary concerning abandoned/stray dogs in Taiwan. I couldn't believe what I saw. I couldn't believe people could be so CRUEL to our best friends who have been loyal to mankind for thousands of years. I couldn't help every one of them by myself. Dogs couldn't speak for themselves, either. But I can let the world know what is going on in Taiwan. That's why I started to build this website, not only for ANNANN, but also for every dog out there whose life deserves our RESPECT & LOVE. There is a growing problem with stray dogs in Taiwan. These dogs are certainly not the problem, but those unloving and cruel people who abandon these poor creatures when they are no longer cute puppies, or are too much trouble for them to handle and feed anymore. The government needs to look at Taiwan's problem in a proactive sense, not a retroactive sense. How do we prevent all these poor dogs from being homeless, unloved and at risk of dying on the streets? 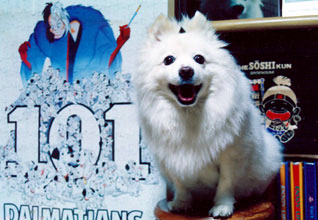 Through educating the public, and sponsoring no-kill shelters. My husband and I, since moving to Taiwan from Canada almost six years ago, have saved one stray dog from a wire chokehold and three stray cats. They have given us soooo much love in return for their lives. God blessed us the hearts to care for animals and to take mercy on those who are at a great disadvantage. Everyday we go around the town we live in and feed as many strays (dogs and cats) as we can find. We know that these animals will have a full belly and at least a few hours of content and rest from not having to search for food. I ask that all those reading this take a moment to contemplate the necessity of helping this problem of strays in Taiwan. Each one of you sees stray dogs/cats on a daily basis. Feed them. Talk nice to them. Appeal to your government to come up with uncruel and humane ways to deal with this problem. Open your heart and your home to a little one today. We all need love -- UNCONDITIONAL LOVE. Do you know the fact that there are more than two million (2,000,000) stray dogs in Taiwan, while Taiwan has only an area 16 times smaller than France? This song is "INTERMEZZO" from Cavalleria Rusticans. 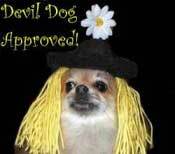 *This is a no-kill non-profit canine website established on June/02/Y2K. **Copyright © 2000 All ANNANN's photos appear on this website belong to ANNANN & CHEN. Always ask ANNANN & CHEN for permission before you use ANNANN's photos.